Turmerlicious is a soothing instant turmeric latte made from coconut milk, turmeric, ginger, cinnamon, a hint of black pepper, and coconut blossom nectar. It is a really quick, easy and delicious way to take turmeric everyday with each serving containing approx 1.5g whole food turmeric powder. Turmerlicious is dairy free, so suitable for vegans and those who are lactose intolerant. Not only is Turmerlicious super healthy with no refined sugar, no GMO, no gluten, no preservatives and no caffeine (except a small amount of caffeine in the chocolate versions), it is really convenient and easy to make! How to use: Just add 3 heaped teaspoons to a mug, add a little cold milk (plant or dairy) to make a paste, top up with boiling water and stir well, then enjoy! If you are making it for kids then add 2 teaspoons of the blend and make with hot milk for a really yummy, soothing, healthy alternative to hot chocolate. Vanilla: Coconut Milk Powder 67% (Coconut milk, Maltodextrin, Modified Food Starch), Coconut Nectar 17%, Turmeric 9%, Ginger, Cinnamon, Black Pepper. Chocolate: Coconut milk powder (45%) (Coconut milk, Maltodextrin, Modified Food Starch), Cocoa Powder (30%)Coconut Nectar 17%, Turmeric 7% , Ginger, Cinnamon, Black Pepper. Ginger: Coconut milk powder (60%) (Coconut milk, Maltodextrin, Modified Food Starch), Coconut Nectar 17%, Turmeric 9%, Ginger (8%), Cinnamon, Black Pepper. I love all varieties of this health enhancing turmeric latte. I love all varieties of this health enhancing turmeric latte. I have to limit myself to one cup each day, as it is quite expensive, but I shall certainly buy it again. As a nutritionist, I happily recommend Turmerlicious as it ticks all the boxes - dairy free, gluten free, caffeine free. 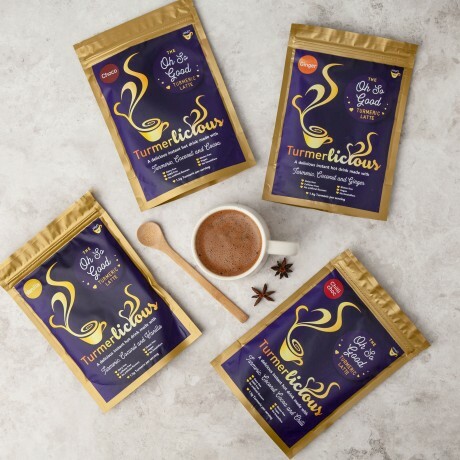 Replacing just one cup of tea/coffee a day with a cup of Turmerlicious is a very simple and effective way of receiving your daily turmeric requirement. The packaging is definitely enticing in a yummy way rather than a beat yourself up and live the perfect life on dried lentils and water way. Really lovely and warming. I have fibromyalgia so avoid caffeinated drinks and this is a superb way of adding nutrients and giving my body some goodness. "I have suffered from Arthritis for a while and needed to have steroid injections to control the inflammation and pain. I first discovered Turmerlicious in March and since drinking it every day, I have now gone twice as long without needing steroid injections - very pleased. It is absolutely delicious plus the rest of the family love it - even the kids. A bit hit for us!" I bought both the dairy free vanilla and choco latte drinks, I love these and have them either as an afternoon slump drink or before bed, the vanilla is more spicy than the choco latte but they are both delicious!!! This product is dispatched by Turmerlicious. This item has a shipping weight of 100g.